"Hi, I am having trouble visualizing my gallery thumbnails on my Android phone. I have checked on my wife's phone but they show up good. When I surf with my Android device and get to a page containing a gallery thumbnail, it does not appear or only appear and then go shrinking until disappearing. I appreciate your help to solve the problem as soon as possible." This is a common issue for Android users, but the problem is not with your images but Android itself. Android is the most popular mobile OS for its user-friendly interface and customizable system compared to the others, which makes Android a bit complicated in some cases. Thumbnails are stored in the cache folder in phone memory so that the phone is not necessary to look for the original one each time you open in Photo Gallery. With low phone memory, you will get a blank screen if you clicked on the thumbnail. Step 1: Kill background or running apps you don't use currently. Step 2: Clean cache or tmp files on Android device. Step 3: Uninstall the app you never used on the device. Step 4: Simply restart the device. 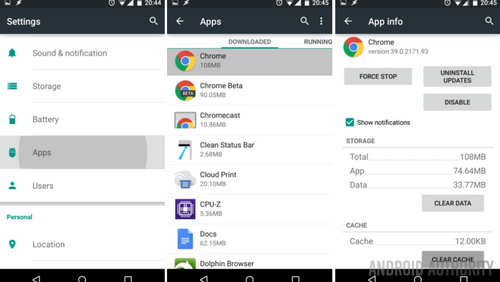 Here is a simple guide on how to speed up memory on Android. It offers detailed steps on how to do this. Step 1: Open Settings app on Android. Step 2: Go to Applications and click Manage applications at the top. Step 3: Tap the icon on the top left corner and select system applications. Step 4: Scroll down to the list and find Media Storage. Step 5: Tap Storage and select Clear Data. Then you need to wait for a few minutes for the task being done. Finally, restart the device. Then you can view thumbnails for now. If you found the tutorial a bit complicated, then you can use third-party cleaning apps. This will be done much faster. No matter which method you chose to follow, make sure you already backed up your data. You don't know what kind of data being deleted during memory release process. Luckily, you can easily do this with free backup apps, such as Easy Backup and Restore, Samsung Kies, HTC Sync Manager, etc.